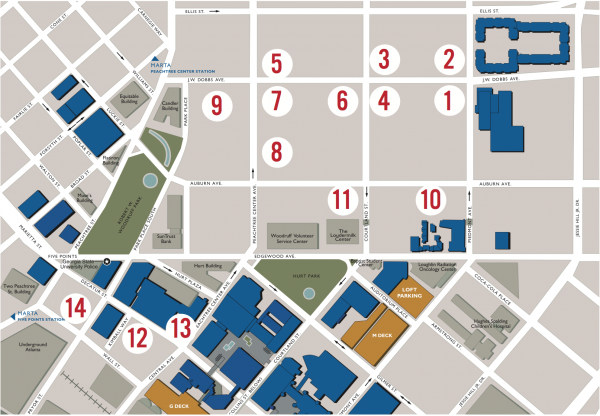 If you drive to campus you know by now that finding parking downtown is no easy task. It is almost guaranteed you will pay some expense to park even relatively close to the main campus. On the other hand, parking decks require monthly or semester payments with the cost of over $200 a semester for most decks. For non-monthly parkers and those without passes or permits, the daily choice of where to park can result in the decision to have extra money for lunch or gas, and whether or not you are late to class. Students can park at Turner Field, but not on game days and must register their vehicle to obtain a parking permit. However, Turner Field is not located near campus and students must catch a shuttle that runs them from the field, to campus every fifteen minutes plus travel time. Numerous daily and monthly parking spots from local companies also abound and their prices vary. Take a look at the break down below to help see if you are getting the most parking “bang” for your buck. $2.25 all decks after 4 P.M.
Streetside parking: Curb parking is available on many of the streets around the campus and housing facilities (noted by the parking machines with a blue P on them) however many do not offer parking for more than several hours and using the machines themselves can be a challenging effort. Upon attempting to check one machines prices for parking the machine asked for zone information or which was not provided and another had an error upon trying to pay for a parking spot. Overview: John Wesley Dobbs has several parking lots up and down the street. While not the most convenient location, the prices are the cheapest per day near campus. Give yourself extra time to get to class. Walking takes about ten to fifteen minutes depending on how far down J. W. Dobbs you park and how quickly you can walk. Notes: This lot is huge and is right off the highway exit for the Commons (John Wesley Dobbs) and the price is decent considering many of the other lots have recently gone up. Expect to hike a bit though; you can save a little time by taking Auburn Avenue to campus instead of walking up and past the Commons. 2. Shell Gas Station (across from the commons) – located directly adjacent to the main entrance of the GSU Commons. The Shell gas station is a great parking choice if your class is at Aderhold or you have at least ten to fifteen minutes to walk to class. The cost makes this lot a real winner for people on a budget, but there are few spaces. Price: $3 for parking less than around 5 hours, though the staff will work with you, $5 for anything more. Location: directly across the street from Congress II Parking. Price: $4/all day; monthly plans available. Address: 85 J W Dobbs Ave. Location: Past the PantherLot near J W Dobbs’ intersection with Courtland Ave.
Price: $3 up to 2 hrs./$5 for above 2 hrs. Price: $4 all day parking. Price: $5.50 all day parking. Price: 0-2 hours, $5, 2-4 hours, $10, +4 hours, $12. Wall St. and Decatur Street. Less than a 5 minute walk from Classroom South and Langdale Hall, Decatur Street and Wall St. are some the most convenient locations for daily parking; however you will pay a price for the close proximity to classroom buildings. Location: Across the street from Walter’s Clothing Shop. Directly across from Classroom South. Story suggested by Georgia State student Brandon Longmere, who wanted to know of other parking options for students near campus.